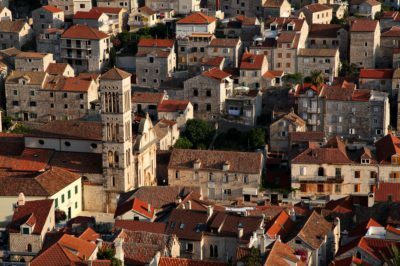 Discover the old town of Split where a walk through UNESCO’s Diocletian’s palace takes you back to Roman times. 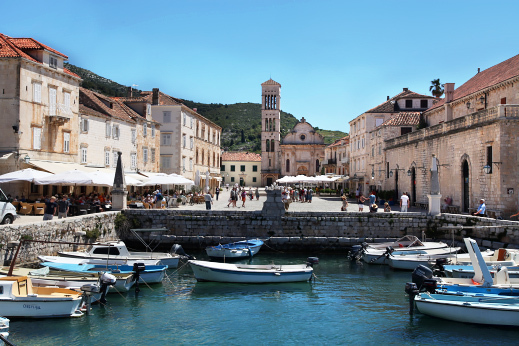 Explore the sunny island of Hvar. 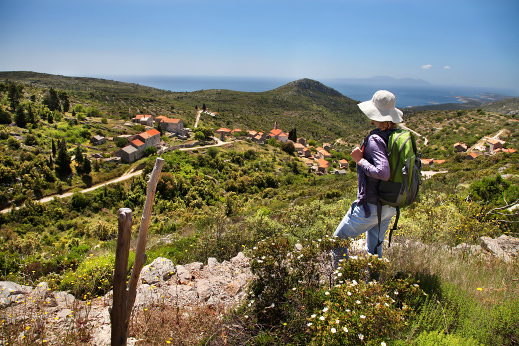 This pearl of Dalmatia boasts superb beaches, centuries-old villages and a wild topography that’s perfect for hiking. Hiking through the island’s rugged interior where you be transported by the scent of lavender and rosemary while walking through old villages and canyons. Meet the locals and boutique wine-makers, try the local spirits and taste the amazing olive oil and freshly-caught seafood. Paddle around the archipelago of Pakleni islands with our superb PRIJON sit-in sea kayaks. Explore the numerous coves with secluded white-pebble beaches and the fragrant scent of Aleppo pines. From Hvar we take you on a day-long cruise to the island of Brac, where you can hike to the remote Blaca Hermitage, built atop a craggy cliff and once inhabited by a secret order of monks. Further on we admire a breathtaking 360° view of Dalmatia from the top of Mt. Vidova (2552 ft), the highest mountain on the islands. We make sure to try Brac’s local delicacy, slow-baked veal and lamb prepared “pod sačom,” underneath a shallow bell-shaped lid that is covered with live coals and allows the food inside to retain all its juicy flavors. We end our journey to Brac on the Golden Cape, probably the most famous beach in Croatia. Spoil yourself with a spa treatment and a fabulous breakfast at the boutique hotel Adriana, situated in the town of Hvar. Explore the town’s great restaurant scene and meet our lovely friend Carmen, an eloquent historian, passionate organic farmer and the island’s only certified aroma therapist. Once back on the mainland we tour the Croatian coastline, heading south through the fertile Neretva plain, also called “Croatian California”. We taste the local produce, including the famous tangerine honey and an exquisite variety of local brandies. A visit to Peljesac peninsula brings us to Ston, home to the world’s second-largest defensive wall, second only to the Great Wall of China. A remnant of the once glorious Dubrovnik Republic, Ston is now a place where the best oysters in Croatia can be found and tasted. We enjoy a gourmet sea-food lunch. 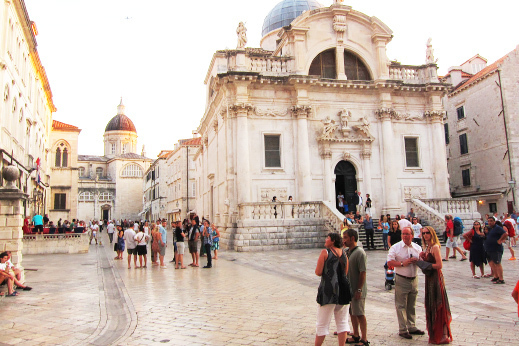 UNESCO’s legendary town of Dubrovnik is the icing on the cake at the end of the tour. This jewel of the Adriatic was once a great rival to the Venetian republic and its grand architecture earned high praise in the writings of the great Marco Polo. Strolling through town you might find some scenes strangely familiar – Dubrovnik doubles as King’s Landing in HBO’s Game of Thrones! 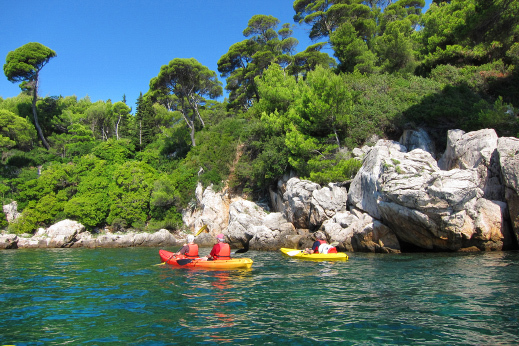 This activity-packed Croatian holiday ends with a sea-kayaking trip to the small Lokrum Island. The old town of Hvar. · Other departures on request from April to October. Tour to Montenegro or Mostar in Bosnia. Split was built as a summer palace for the Roman emperor Diocletian – the Diocletian’s palace in the old center of town is a UNESCO World Heritage Site that will transport you back to the Roman times. Probably the most charming town in Croatia, Split is nowadays a cosmopolitan melting pot of grand architecture, exquisite dining opportunities and a vibrant art scene. Here you can forget about the passage of time and enjoy the Mediterranean as it once was. We take an afternoon walk through the Diocletian’s palace and enjoy a very special dinner in the old town. As an introduction to Croatian cuisine you will try a variety of traditional Dalmatian dishes. Town of Hvar with Pakleni islands in the backdrop. Today we set off for the islands. The island of Hvar is widely considered to be one of the most beautiful islands in the world, and for good reason. The sun never stops shining on its picturesque landscape, which is dotted with small medieval villages built in stone and swathed in lavender fields and vineyards. Surrounded by the clear blue sea and home to a fascinating culture dating back to the Venetian times it is a truly unforgettable destination. Our first stop is at Jelsa, the island’s historical center and home to one of its best wine cellars. We taste the exquisite Plavac, made from a red grape indigenous to the Dalmatian Coast that is thought to be the ancestor of Californian Zinfandel grapes. In a small village not far away our friend Marinka, a local artist, invites us to visit her beautiful estate where she treats us to a delicious lunch prepared from food grown in her organic garden. We have a chance to pick fresh figs and herbs from her garden and take a look at her interesting paintings. In the afternoon we arrive to the town of Hvar where we are accommodated in a lovely boutique hotel. Spoil yourself with a spa treatment or simply enjoy a drink by the hotel’s swimming pool. Hiking in the wild and untouched nature. After a gourmet breakfast on the hotel’s terrace overlooking the main square we set off for an activity-packed day. An old route across the island takes us into the hills where we start the day’s hike. From the village of Velo Grablje, which was once the island’s biggest producer of rosemary oil, we walk through a small canyon to the deserted stone village of Malo Grablje. With a bit of luck we meet Berti, a local icon and the last descendant of a once mighty Tudor clan. His herbal spirits are legendary around these parts. The second part of the walk is along a coastal trail, passing secluded coves scented by the fragrant Aleppo pines. 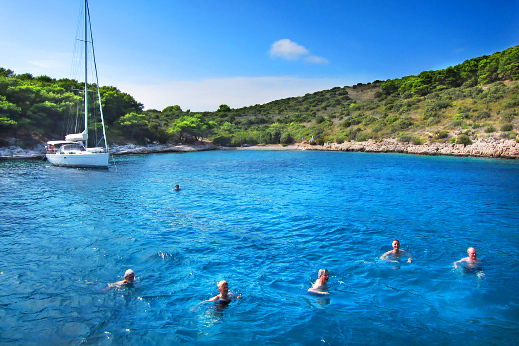 We finish the hike on a white pebble beach where you have the chance to take a refreshing dip in the Adriatic Sea. Enjoying a dip in the sea at one of the secluded beaches of Dalmatia. In the afternoon we meet our host Carmen, a local resident and the island’s only licensed and formally educated aroma therapist. 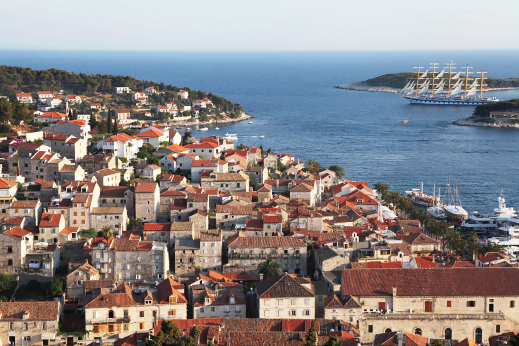 She takes us around the charming city of Hvar, explaining its rich local history. Strolling along the narrow cobbled alleyways bordered by bougainvillea we take in the town’s old Venetian architecture and vibrant atmosphere, passing locals selling lavender and sage on stalls overlooking the small harbor or simply enjoying a glass of wine on the main square. 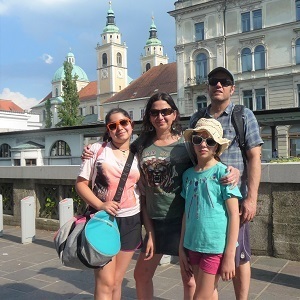 Our walk concludes in a beautiful Habsburg garden where Carmen introduces us to the tradition of making the aromatic oils that the town is so famous for. Afterwards it is also possible to climb up to the city fortress to catch the sunset and a great view of Hvar’s old town. 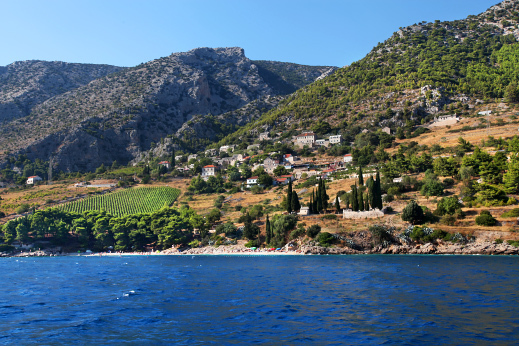 Island of Brac – full of lavander fields, vineyards and pine trees. Today we board a private boat for a cruise to the island of Brac. The largest of the Dalmatian islands, Brac is famous for its wild untouched nature and the white limestone used for building decorative stonework. This centuries-old craftsmanship dates back to the Roman times, when even the emperor himself used stone from Brac to build his palace. Later on the stone was exported overseas and even used in the construction of the White House. After dropping anchor in the hidden bay of Blaca we start our hike up to a 450-year-old hermitage. The hike stimulates our senses: we are surrounded by pine trees, aromatic flowers, and the scents and sights of the sea. The monastery of Blaca once traded honey, wine and olive oil with the Venetian crown. This gave power to the monks who specialized in astronomy and their hermitage became a world-renowned astronomic observatory. We enjoy our lunch in a perfectly preserved Dalmatian stone village high up in the hills. Our hosts treat us to the local specialties cooked on open fire “under the bell”. Imagine mouth-watering lamb, baked organic veggies with fresh herbs, and much more. In the afternoon we continue to the top of Mt. Vidova, the highest peak of the Dalmatian islands, from where you can catch a glimpse of the famous Golden Cape beach deep below. Afterwards we drive down to the town of Bol where our boat is waiting for us. Let’s enjoy a nice sundowner while cruising back to Hvar. 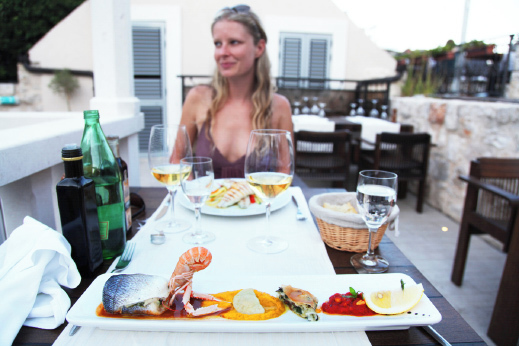 Tonight you can explore Hvar’s restaurant scene on your own. If you’re overwhelmed by choice our guides are happy to recommend the best restaurant for your evening getaway. We set off for Dubrovnik. Our first stop is the Neretva plain, also known as “Croatian California”. It is renowned for growing the best fruits in the country, which is why we’ll make sure to stop by the stalls where you can try tangerine honey, organic fruit, walnut snaps, and other local delicacies. On our way to the Peljesac Peninsula we cross into Bosnia for a short while. The Peljesac peninsula, also referred to as “the gardens of Dubrovnik”, was once protected by Europe’s longest stone wall, which is still beautifully preserved in the town of Ston. The peninsula produced delicious wine and precious salt for the Dubrovnik Republic. We take a hike on Ston wall and reach the sea just in time for lunch at a local “konoba” (traditional restaurant) serving mouth-watering seafood, such as scampi risotto and black ink pasta with Adriatic squid. 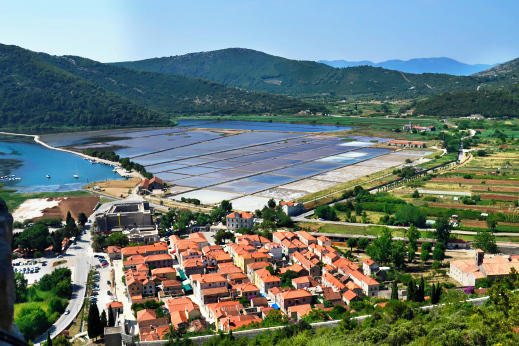 Ston is also home to Croatia’s best oyster farms, which send their oysters to the Croatian president on a regular basis. We have a chance to taste them fresh out of the water, as usually enjoyed by the local fishermen. We finish the day in Dubrovnik. With its luxurious historical buildings, shipbuilding industry and spice trade with the Far East, Dubrovnik was once the main competitor of the Venetian Republic. But nothing can beat the sight of the crystal-clear sea surrounding Dubrovnik’s massive stone walls, which protect the old part of town. For over a century Dubrovnik has been attracting visitors from all over the world with its historical architecture, mild climate, crystal-clear sea lapping against beautiful beaches and bays, outstanding Mediterranean cuisine and friendly people. Nowadays it is a popular hideout and summer destination for celebrities and travelers that want to combine natural beauty with history. One can explore gorgeous islands dotting the ocean just offshore during the day and spend the evening listening to a classical music concert in the most beautiful town of the Adriatic. A guided tour of the old town is followed by a sea-kayaking trip to the nearby Lokrum Island. Alternatively, you can choose to enjoy a free afternoon exploring the “Pearl of the Adriatic” at your own pace. Time to say farewell and transfer to the airport.